There are so many things we hear as we grow up aren’t there? You can do anything if you just put your mind to it. Life is never as it seems. We hear our parents talk about how things have gone differently than they expected and in our young invincible minds we think – that’s not going to be me. I was standing in the narthex of the Cathedral, with my heart in my throat, hoping that I wouldn’t actually puke in front of the thirty priests and one archbishop standing behind me. Was this day actually here? I was about to walk down this long beautiful aisle. I was in the perfect dress. Every curl on my head was perfectly placed. Everyone I had ever loved as I grew up, in college, as an adult – they were all lining the aisle of this church awaiting my entry. And the perfect man was awaiting me at the altar – in the tabernacle. I had imagined this day for my whole life, planned it years ago like so many have, imagined what the perfect, extroverted, bearded man God had for me would actually look like. But today I was walking up the aisle, not with my dad, but with two attendants, to an altar prepared not for the sacrament of marriage, but for the consecration of a virgin to her spouse, Jesus Christ, true God and true Man. "But today I was walking up the aisle, not with my dad, but with two attendants, to an altar prepared not for the sacrament of marriage, but for the consecration of a virgin to her spouse, Jesus Christ, true God and true Man." The same questions that had gone through my head five years prior when I heard this quiet call in my heart were now deafening in my mind as I prepared to walk down that aisle. Really Lord? You want me? I’m only a nurse. I use four letter words all the time. I sometimes sleep through my holy hour. I confess the same sins over and over again. I have a lot of tattoos and I’m getting more no matter what you say. I need to be around people all the time. I need a man to take care of me. I am way too emotional and Italian for this call. Are you sure you called the right woman to be yours forever? Are you sure you want me? My friend saw the sweat beading on my forehead as I approached the entrance to the cathedral and she whispered in my ear, “just keep your eyes on the cross.” I walked step by step up that long aisle staring at my King crucified on the cross being processed in before me. When that cross disappeared from my sight it was replaced by the statue of Mary, my mother and the first consecrated virgin in history and my entire body relaxed. Yes he called you. Now come and enter into a life with your beloved. I remember the day God called me to be consecrated. I almost crashed my car I was so shocked. I am from a big Italian family and I knew the plans for my life. Be a nurse, meet an Italian hottie, marry him and have lots of Italian babies. That was the answer to life’s questions. But then God broke into a small space I had left him and shattered all my expectations. I want you to be mine, exclusively. I want you to be consecrated as my bride. I want you to live in the world, work as a nurse, be my light in a way that no one even knows you are trying. I want you to be ordinary for my kingdom. And I want you to trust that I will lead you. You know sisters, I have always been one of those people who dismisses “pious” statements like just trust in God and he will give you freedom. Blah, blah, blah. I am free, don’t you worry about me. I know Jesus, I know he saved me, I pray, go to mass, I do all the stuff. But sisters, I was humbled in a way I never imagined possible. There are no words to describe the freedom I found in following the call for my life. I never knew I was afraid, until he had shattered my fears. I never knew all the areas I was insecure, until I saw myself as he saw me. I never knew how much stronger, braver, more feminine, more beautiful, more myself I could be until I entered a true life with Christ as the woman he called me to be. This is not just the gift of vocation, this is the gift of being known by Christ and living in the freedom of that knowledge. Whether you know what your vocation is, what you are going to do with your life, what major you will choose, how you will love your husband well, how you will handle one more child in your growing family you - you are known. You, in your messy, hair not done, no make up, ugly crying way. You are known and loved. And there is nothing more freeing than being a woman who is known and loved. That woman can conquer the world. We, sisters, can conquer the world. "Whether you know what your vocation is, what you are going to do with your life, what major you will choose, how you will love your husband well, how you will handle one more child in your growing family you - you are known." 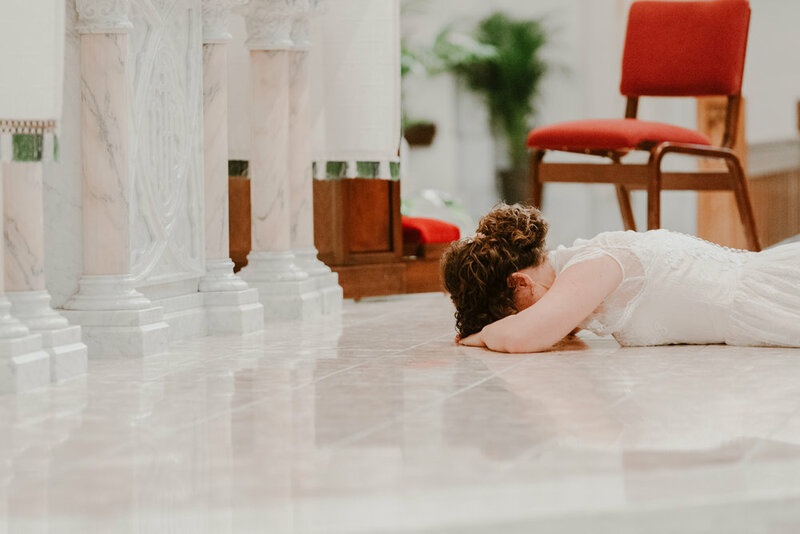 As I lay prostrate on that altar, listening to the names of dozens of saints being called to pray for me I found a new confidence, freedom and joy, unlike anything I had ever known. Yep – I want you. You crazy, emotional, Italian, extroverted, tattoo covered, f’bomb dropping love of my life. I want all of you. Together, we are going to change this world for my Father’s kingdom. So come as you are and let him show you who you really are – see what he does. It will be ordinary but through his love you will be the most extraordinary woman history has ever seen. My name is Andrea Rose Maria Polito. I’m a 32-year-old consecrated virgin livin’ the “high” life in Denver, CO. High as in altitude, not marijuana (I know you thought it!). I am a proud member of a large and loud Italian family and I fall last in a line of five. I am also a proud auntie to 13 humans who are way cooler than me. I grew up in Southern California and sometimes miss the beach so much that I contemplate a 15-hour road trip just to listen to the waves. BUT I often “settle” for the glory of the Rocky Mountains. I love being outside hiking, running, biking and snowboarding. I’m a pediatric oncology nurse and have been for a decade (not sure how that happened!). Random facts: I have 5 tattoos, and Jesus and I are discussing the 6th, I would only wear rainbows and converse if I could, I love to travel and I haven’t brushed my hair in about 25 years. As a consecrated virgin my number one priority is to support the diocese in prayer and to be a witness of the faith with my life. I have a pretty boring, routine life. Wake up, holy hour, mass when possible, go to work, take care of the kiddos, come home and if I’m lucky in bed by 9pm. One of the hallmarks of this vocation is trusting without sight - I trust the Lord is using me in ways I can’t see in the secular world. That somehow the witness of my life is doing something in the hearts of the people I encounter. My discernment was turbulent, mostly because I’m a wildly emotional person. But whenever things seemed overwhelming my spiritual director would always tell me, “Andrea, you can walk away from this at any moment. You are not bound.” Did he or I think I wasn’t called to consecrated life? Heck no – we knew it was right. But the key was freedom – no matter what point of discernment I was in the Lord wanted me to be free to choose him. The Lord is not manipulative or a bully and he draws us to himself in freedom. To the woman who’s unfamiliar with consecrated single life: could you share what it means to be a consecrated person? I would love to but first things first. “Consecrated single life” doesn’t exist. The nature of consecration is bridal, it is a vow to our Lord. I am a bride of Christ. Calling me a consecrated single person is like calling a married woman a married single person. I am a consecrated virgin and on July 22, 2017 on the feast of Mary Magdalene I was placed in the order of virgins with many saintly women before me. It is one of the oldest vocations in the church. Intended to be a prayerful powerhouse for the local church and a witness in the world where priests or religious cannot reach. It is a way to live an “ordinary” life with an extraordinary spouse – Jesus! If someone were interested in learning more about consecrated life, what’s the best way for them to learn more? Ask me! I would love to talk about it with you. There is also a website for the united states association of consecrated virgins, which has many resources. There are also other forms of lay consecrated life worth looking into such as societies of apostolic life and secular institutes. I have an Instagram account which is @arpolito13 and my email is arpolito13@gmail.com. Easter or Pentecost – not sure you can call a “tie” when Easter is involved but if you can I will! Saint Mary Magdalene or Servant of God Madeleine Delbrêl – haven’t heard of her? Look her up – she is incredible. when I am enjoying a cup of coffee with friends in the mountains.